This basic potsticker recipe is easy to master once you gather all the ingredients, and leaves lots of room for improvisation. 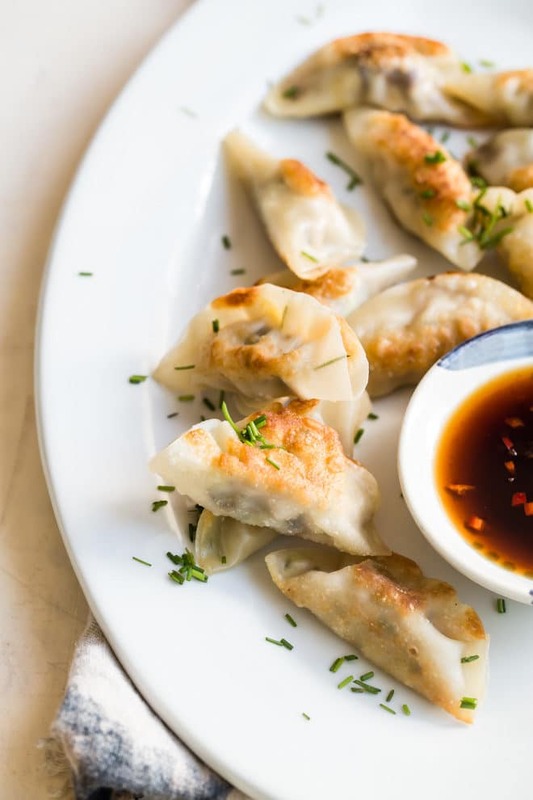 Making your own dumplings from scratch can be a fun and delicious way to celebrate the weekend, just be sure to make extra to freeze for last minute dinners. Pot stickers, or jiaozi, earn their name because as they cook, they stick to the sides of the wok or pan. This was probably an accident, discovered by a forgetful cook who let the water in the wok dry up and came back to find crispy dumplings instead of soft ones. Sometimes kitchen accidents can be a good thing, especially because potstickers are universally loved today. Need dumplings for a party? Click and slide the number next to “servings” on the recipe card below to adjust the ingredients to match how many you’re feeding—the recipe does the math for you, it’s that easy. What are Pot Stickers made of? Traditionally, pot stickers are made of minced meat and an assortment of savory fillings: mushroom, ginger, garlic, onions, and cabbage. 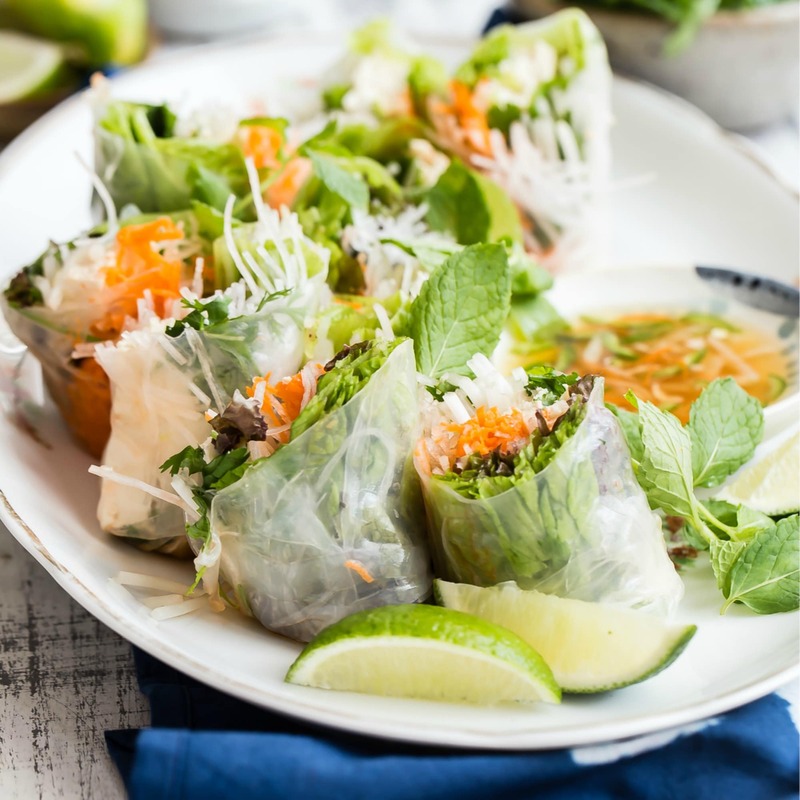 They have fairly thick, often homemade wrappers that crisp up nicely on the outside while staying soft and juicy inside. Shrimp Pot Stickers: substitute finely chopped raw shrimp for the ground pork, or mix shrimp and pork together for shrimp and pork pot stickers. 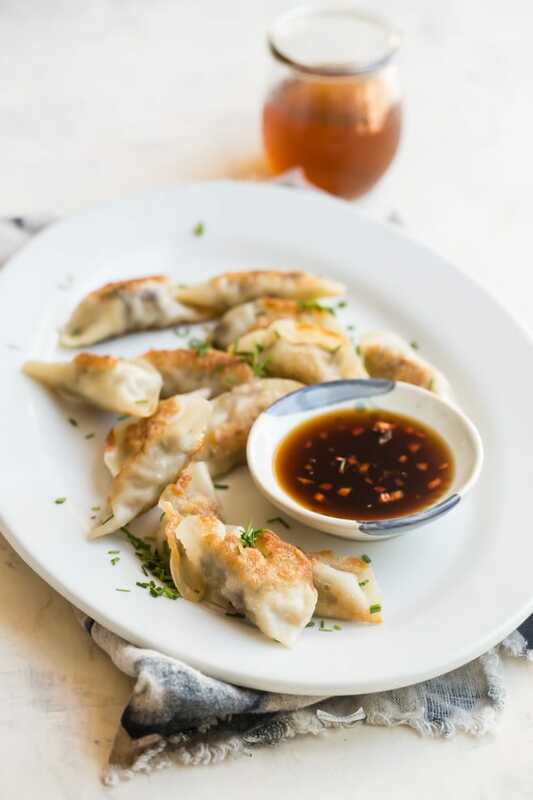 Vegetarian Pot Stickers: To make these potstickers vegetarian, use 1 cup of dried shiitake mushrooms and 1/2 cup of shredded carrot in place of the pork. Use water or vegetable broth for the steaming. Kimchi potstickers: Mix it up and make a Korean potsticker by adding some drained and minced kimchi to the filling, with the pork or without. 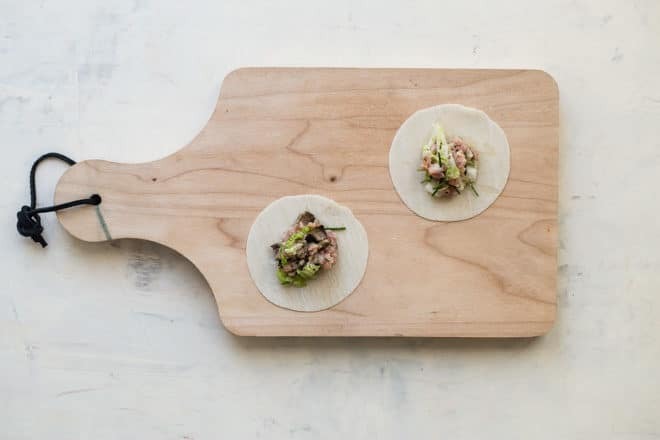 Lamb potstickers: Use ground lamb and ground coriander seeds in place of ground pork. Salting the cabbage to pull out the water. Depending on what you include in them, pot stickers are a great way to eat more vegetables and make a meal with very little meat. Even though they’re pan fried, they’re more browned in oil than submerged in it. 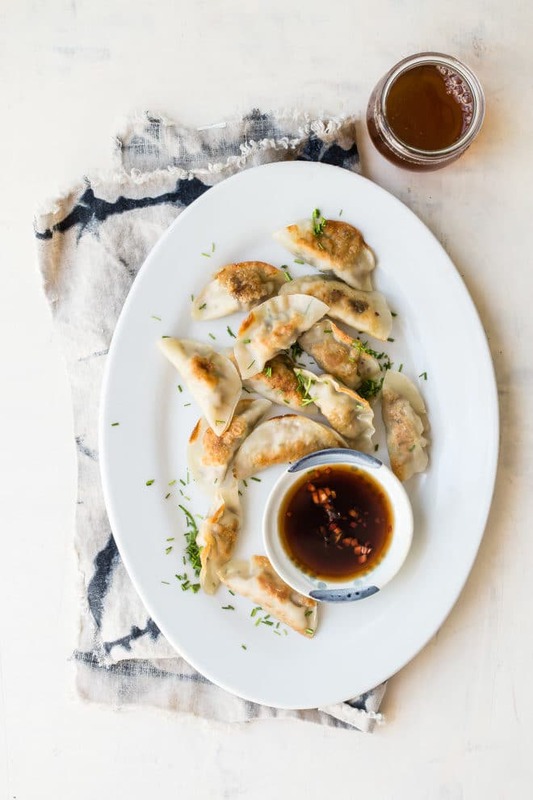 Plus, when you make your own potstickers, you have more control of the total calorie content of your food, making it healthier for you to eat. 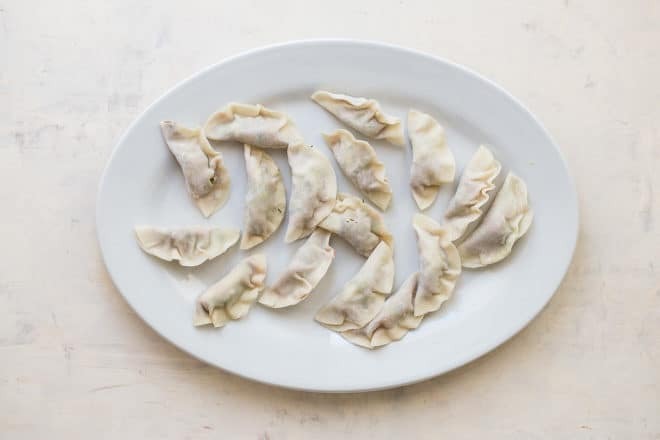 A dumpling can refer to just about any cuisine’s version, including Polish pierogies and Italian ravioi, but pot stickers are a more specific type of Chinese dumpling distinguished by a specific method of cooking, a fry-pan-fry method that keeps things crispy on the outside, juicy on the inside. Gyoza, another type of Japanese potsticker, was inspired by the Chinese version, and brought to Japan by soldiers stationed in Manchuria during WWII. Before you start, it’s important to have a clean work surface and all your ingredients prepped and ready to go. Also, I like to keep a slightly damp paper towel over the won ton wrappers so they don’t get too dry—there’s a little bit of a learning curve at first, but soon enough you’ll be wrapping like a pro and having fun, too. To fill each pot sticker, place a wonton wrapper on a work surface and brush the edges with water. Place 1 teaspoon filling in the center of the wrapper, fold the wrapper in half to enclose the filling, and pleat the outer edge, pressing damp edges together firmly. Repeat with remaining filling and wrappers. 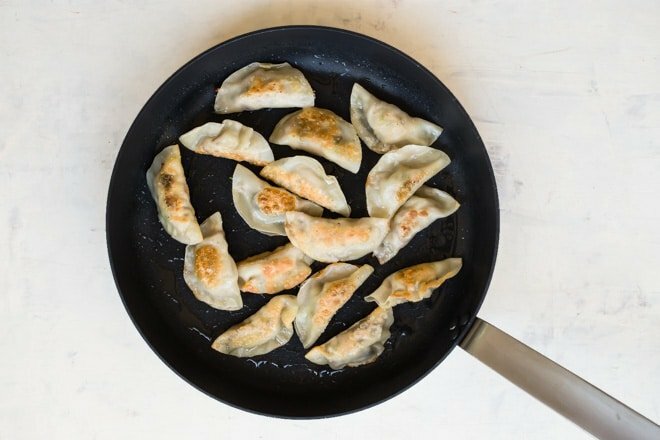 How do you cook Pot Stickers without sticking? Even though they’re called pot stickers for a reason, it’s kind of nice to be able to get them out of the pan in one piece, right? A little trick I use is that once the broth is added, I keep the covered pan jiggling vigorously so the dumplings move and don’t have a chance to adhere to the pan. Can you freeze Pot Stickers? These pot stickers freeze really well. If you’re making these for the week ahead, you can place them on a tray, slide them into the freezer, and then store them loose in a zip-top freezer bag once they’re frozen. This keeps them from sticking together while they’re freezing. Use within the month. How do you cook frozen Pot Stickers? Conveniently, you can add frozen potstickers to a hot pan and cook exactly as directed in this recipe using the fry-steam-fry method; there’s no need to thaw them out before cooking. There are almost infinite ways to eat these delicious dumplings. They’re great as an appetizer with a bracing cocktail or ice cold beer, but they’re just as good as a main course with some steamed veggies and rice. If you’re feeling ambitious, try making several different kinds of potstickers and you’ll have a culinary adventure every night of the week! This is a fast and fabulous dipping sauce for dumplings that is easy to make. 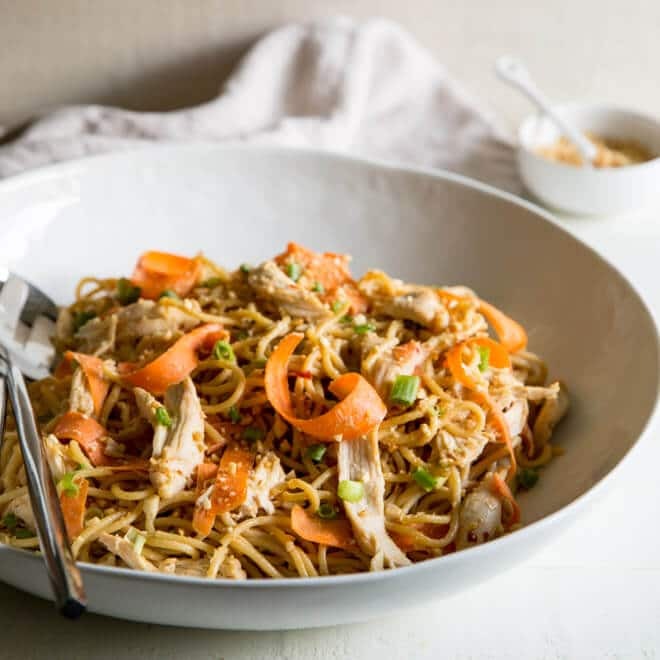 In a medium glass or stainless steel bowl, whisk together vinegar, soy sauce, water, sugar, sesame oil, and Sriracha until sugar is dissolved. Whisk in ginger, garlic, and chile. Use immediately or cover and refrigerate for up to 2 days. How do you make Pot Sticker soup? Heat 1 1/2 teaspoons sesame oil in a saucepan over medium heat. Add garlic, ginger, and green onions and stir until slightly softened. Pour in chicken broth and bring to boil over high heat. Reduce heat to medium and add the vegetables and potstickers, (frozen or fresh) cooking until the dumplings float. 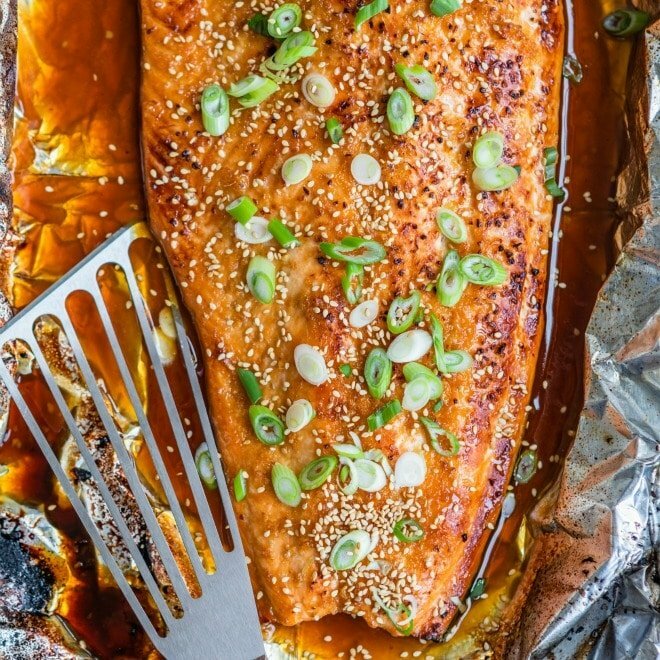 Season with soy sauce if desired, and drizzle on remaining sesame oil. 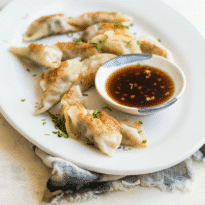 Save this Pot Sticker Recipe to your “Appetizers” Pinterest board! Soak the dried mushrooms in warm water in covered bowl for 30 minutes. Drain, remove stems, and mince the mushroom caps. 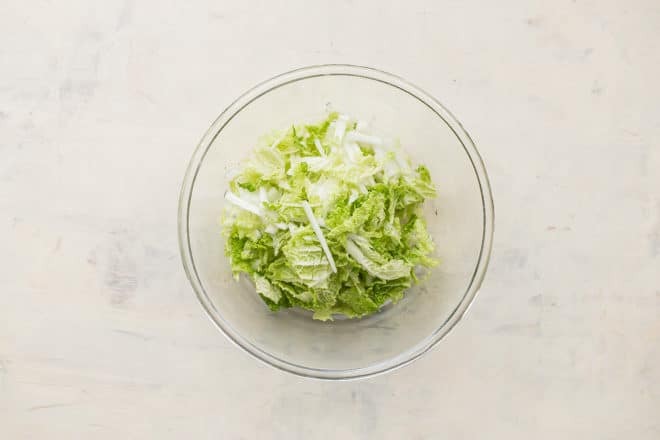 Meanwhile, In a large bowl, toss together the cabbage and salt and let stand for 30 minutes. This will help leach the water out of the cabbage. With your hands, wring out as much of the water from the cabbage as possible. Discard water and place cabbage in a new bowl. Add mushrooms, pork, chives, soy sauce, sesame oil, rice wine, ginger, garlic, cornstarch, and pepper and mix with a rubber spatula to combine. 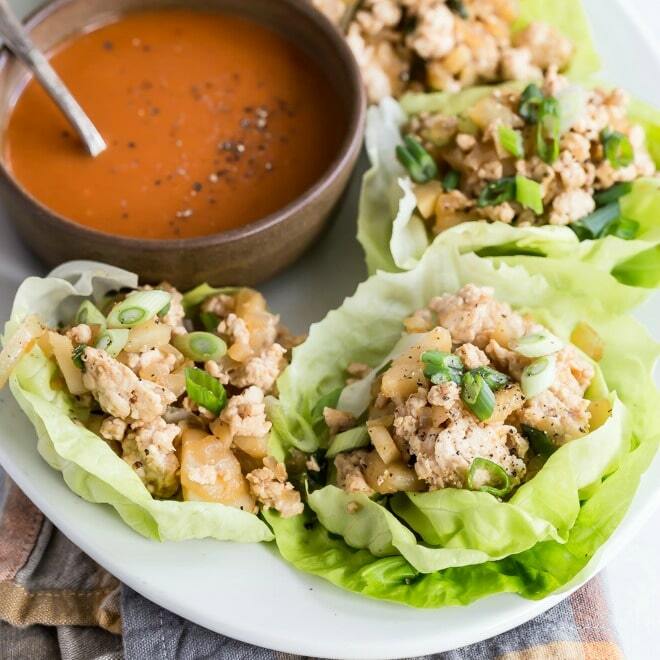 To fill each pot sticker, place a wonton wrapper on a work surface and brush the edges with water; keep the other wrappers covered with a slightly damp kitchen towel to prevent them from drying out. Place 1 teaspoon filling in the center of the wrapper, fold the wrapper in half to enclose the filling, and pleat the outer edge, pressing damp edges together firmly. Repeat with remaining filling and wrappers. Preheat the oven to 250 degrees. In a large nonstick frying pan over medium-high heat, heat 1 tablespoon canola oil. Add 10-12 pot stickers, flat bottom down and in a single layer. Sear until golden brown on the bottom, 3-4 minutes. Pour 1/4 cup broth in the pan, cover, and let steam until all the broth evaporates, the pot stickers are tender but still firm, and the filling is cooked through, 4-5 minutes. Transfer to a platter, cover with aluminum foil, and keep warm in the oven. Cook the remaining pot stickers and broth in three more batches. 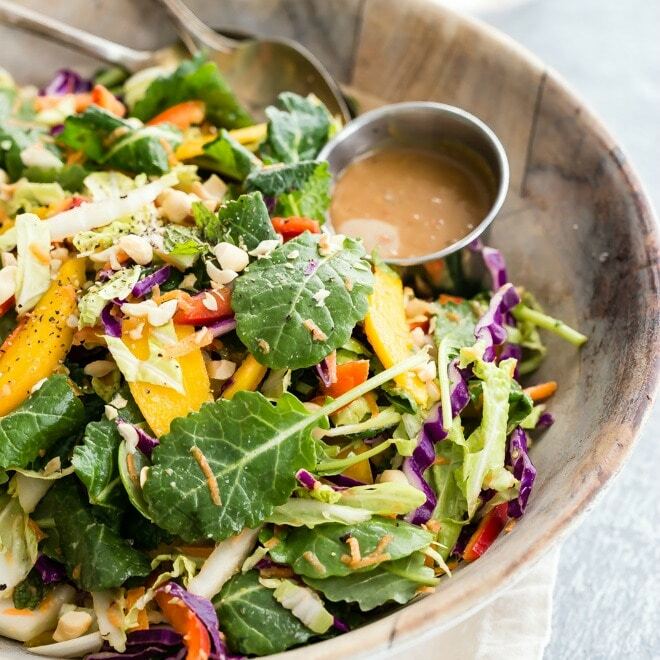 Serve with the ginger soy dipping sauce. In a medium non-reactive bowl, whisk together vinegar, soy sauce, water, sugar, sesame oil, and Sriracha until sugar is dissolved. Whisk in ginger, garlic, and chile. Use immediately or cover and refrigerate for up to 2 days. Makes about 1 1/4 cups. To pleat a filled pot sticker, after folding the wonton wrapper into a half-moon, pinch the edges together at one end of the arc. Then, using your thumb and index flnger, and starting from the sealed end, make 4 or 5 pleats, or tucks, along the arc to enclose the filling completely. As each dumpling is formed, press the bottom gently against your palm to flatten it slightly. These are my hub’s absolute favorite when we go to Chinatown! Can’t wait to make them tonight. It looks way easier than I thought!